No matter where you live there’s a Hydrangea for you. Once you fall in love with one, you’ll find out something important: it turns out it’s impossible to only have one. You’ll want more and more. Having several in your garden is the only solution. Over the years I have added more and more Hydrangeas to Rosebrook Gardens, making them a signature in, and a staple of, the overall garden design. Years after planting them they still continue to provide the most powerful and colorful blooms with long lasting effects. I love to hand-pick each oversized flower to create my own flower arrangements, and the Hydrangeas are some of the most breathtaking blooms, so my abundant plantings offer me many resources to choose from. One recent Sunday afternoon, while tending to my garden chores, I began in the front yard working my way around the entire property. As I do I deadhead flowering plants, stake drooping blooms, and address any issues that may be in need of my services. (It’s true, I don’t have a staff, it’s just me.) Well, while doing this I was suddenly captivated by a vision that took my breath away, inspiring me to write this article. Wherever I looked there was a Hydrangea plant to feast my eyes on. 360 degrees of Hydrangeas — they surround the property and no matter where I looked these “over the top” flowers greeted me. They put me in a trance; not sure if it was perhaps the mophead flowers — so-called because of their large round flower heads resembling cheerleading pom-poms — or perhaps the lace caps that bear round flat flowerheads. The vibrant colors and textures in their fluttering green leaves were all I could stand, and I needed to stop, sit, and photograph the intensity that caused the spell I was in. This made me think of all the lovely people who have commented on my Hydrangeas and who have enjoyed them with me. Truth be told, how I get my flowers to be so spectacular and prolific is often asked of me, so with no further delay, I’m offering my knowledge and resources. 1. I do not discriminate. Over the years I have bought my Hydrangeas at grocery stores, garden centers, and even the garden club’s yearly plant sale. 2. Buy for flower shape and size. I personally don’t try to change their color. I let them produce whatever fabulous color flower they want. I’m always perfectly delighted that I get the flowers at all, more so than what color they are. 3. Combine verities. You’ll be surprised how wonderful this looks when you clump varieties in groups. I have even found I can get different colors in the same area from a combination of Hydrangea plants. This is a fantastic way to display. 4. Come October removes every last flower. Yes: every last one. Take the best of the best and make yourself an arrangement, as the autumn colors offer an interesting bouquet alternative. 5. Fertilize in the fall with Holly-tone 4-6-4. Holly-tone is the best combination of nutritional ingredients for acid-loving plants. One cannot have a garden without a supply of Holly-tone! I love looking at and picking my Hydrangea flowers, but come late summer after all signs of new blooms are over it’s time for me to get to work and prune. Prior to fall is the best time to reshape, prior to them going to rest. I trim off enough to reshape the plant. If the plant is over 5 years old, I take about 25% off — this keeps the plant vibrant come spring. Since the goal is to get your Hydrangea to bloom the most it can, if you are pruning in the Spring you might easily prune the growth-to-come without realizing it. Most Hydrangea varieties will not bloom on new growth because they require this new growth to age one year (it changes from being referred to as “new wood” to “old wood”) before a flower will bloom off of it. Now there are a few exceptions to this: there are indeed a couple of varieties that bloom on “new wood.” Endless Summer and the Annabelle, for example. However, these are only about 10% of all types of Hydrangeas, so you don’t really have to worry about whether or not you can identify them — just treat them the same, as you’ll always get blooms. So after pruning in Fall I then patiently wait until June, allowing the plants to tell me where I should prune next. I take off only areas of dead wood that are clearly dead and do not have a sign of new growth or buds. While some single stems could have several feet of healthy new growth their top portion may have none. I remove this by making a clean cut at a slight angle just above the new growth — removing any stem pieces that offer no signs of life. By waiting till June you will guarantee that you are not removing any of the flowers waiting to emerge in the upcoming season. For me it’s June, but depending on where you live the month may vary (heck, it might even vary thanks to global warming, never mind where you live.) Learning the timing is all about watching and knowing. Regardless, if you do not pick your flowers all off and/or wait for your Hydrangea to fully leaf out before pruning then you’re too late. 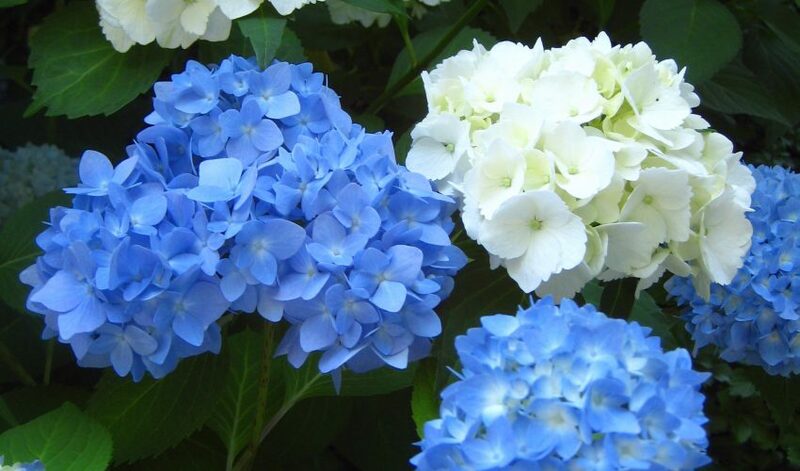 Hydrangeas require acid soil and the color of the flowers will vary according to soil pH. If the pH is in the range of 5.0 to 5.5 the color will be a soft blue. With a pH of 6.0 to 6.5 or higher there will be pink flowers but why change perfection. If you want to know how to change your soil’s pH go ahead and search that on the internet; personally, I far prefer letting Mother Nature surprise you. How to avoid picking flowers only to have them wilt quickly indoors? Remember: just as we perspire, flowers give off moisture on a hot day. So it’s best to pick your flowers in the early morning, as the roots have had plenty of time overnight to drink plenty of water — meaning they will resist wilting much longer. Plus, they plant is resting from the work of the photosynthesis process the day before. Another choice is after sunset when the plants have had a chance to return to their “waiting” period. Bang back the stems to open up water flow. Cut the flower stems to size for your vessel, then because the stems are woody you must break up the bottom to allow maximum water absorption to the flower; about one inch to two inches from the cut. I call it the “bang bang” technique. You can use the knuckle of your index finger (like I do), or lightly tapping with a small tack hammer works well. So there is my 360 degrees of Hydrangeas — with a little “Hydrangeas 101″ thrown in. Knowing my secrets, and understanding what to do when will help you get the best results with your Hydrangeas. Having multiple varieties throughout the perimeter of your property will give you, too, 360 degrees of beauty. These long-lasting blooms will become everlasting in your mind, not just in your garden.